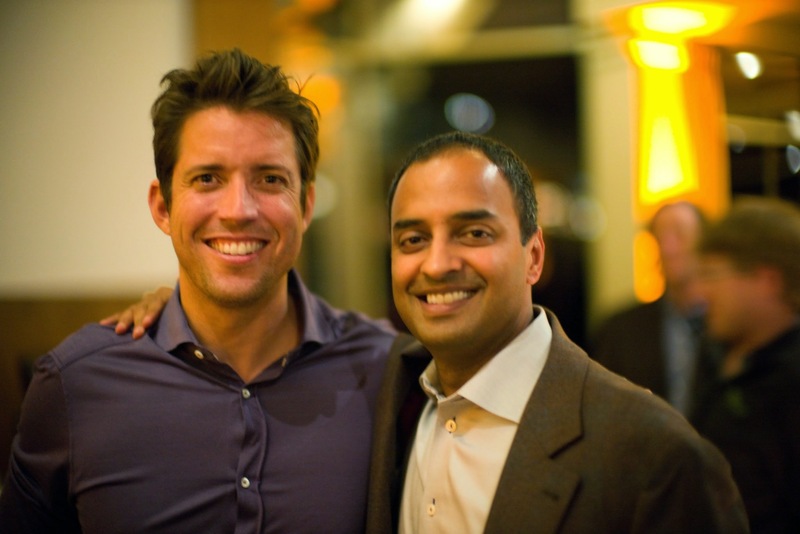 Nick Woodman & Ravi Viswanathan speaking at NEA’s tech CEO retreat last week, Nick Woodman called out culture again and again as a fundamental and determining factor in his—or any—company’s success. As the founder of recently public GoPro, Nick has spent plenty of time in the trenches telling his story to investors, consumers and employees—being able to articulate how he’s built a wildly successful business, and why it will continue to be successful, is mission critical. 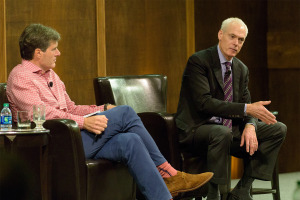 And as Nick told a roomful of CEOs and investors that evening, culture is everything. The assembled CEOs were a mix of brand new and deeply established, challengers and market leaders, across the full spectrum of tech sectors. In a portfolio as diverse as NEA’s, there is little opportunity for “one size fits all” advice. But in a conversation about culture, the lines drawn between sector and stage dissolve—it is equally important whether you have 10 or 10,000 employees. There is nothing NEA values more (or protects as fiercely) than our culture. It is who we are. This was our founders’ intent more than 35 years ago; they wanted to create something much bigger and more enduring than a few big names and marquee deals. They wanted to build an institution, one deeply rooted in its core values (especially integrity, teamwork), transparency and aligned incentives. More than $13B, countless market cycles, and several leadership transitions later, we have come to value that culture above all things. Because we know it’s what makes us different. What I didn’t fully realize until last week is that our entrepreneurs know it too. Jim Collins, bestselling author of Good to Great and How the Mighty Fall, and co-author of Great by Choice and Built to Last, opened our sessions with a fantastic keynote. He talked about why some companies achieve greatness, while others are just…good. He talked about the difference between founders who truly want to build, versus those who are content to flip. 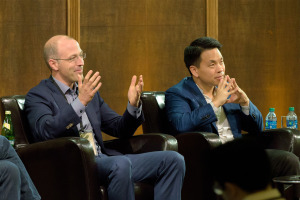 Later an entrepreneur was telling me about a partnership deal they’d just done with one of the biggest players in their space, and the two very different reactions he’d gotten from his investors—one saw the deal as an inflection point on the journey, while the other saw it as a springboard to a quick exit. While neither response is wrong, they speak volumes to the entrepreneur. Most entrepreneurs have a fire in the belly, but for some it burns with a little more intensity—they’re not just running with a good idea, they want to build something. They’re looking down the road and around the corners, and they want their investors to be equally committed to their journey. It’s those entrepreneurs who are most likely to choose to partner with NEA. We tend to celebrate the milestones but stick around for the journey. We cannot overstate the role culture plays in how successful that journey is—or isn’t. A founder’s earliest decisions as CEO will become part of the fabric, the DNA of their business. And over time, intangible traits like culture will become measurable in very tangible ways—first and foremost of those is execution. Few people have a track record of execution like Frank Slootman, President and CEO of ServiceNow and former CEO of Data Domain. NEA and the now-legendary executive have a long history—NEA backed Data Domain in 2001, brought Frank on as CEO in 2003, and supported the company through its 2007 IPO until its acquisition by EMC 2009 for $2.4B. During Frank’s fireside chat with Scott Sandell, you could have heard a pin drop in the room as he shared insights on scaling a business, building a team, and fostering a culture in which that business and team will thrive. As the retreat drew to a close, I began thinking about my own takeaways. And it occurred to me that maybe we don’t talk about culture enough. Because it’s intangible, it can also seem ephemeral and subjective. But ultimately, everything a company (or a firm) becomes is a reflection of its culture—it matters from day one and every day after. It’s at the heart of everything we do at NEA, and we’re grateful to share it with the amazing entrepreneurs who choose to work with us. Our team was inspired and energized by our conversations about culture during the retreat, and I hope our CEOs were too. When they examine the culture they’re creating in their companies, I hope they find it consistent with the business they want to build. And whatever they find, I’m confident they know we’re here to help.